Browse through my work, see the schedule for my upcoming shows, and many other aspects that can give you a full picture of my history and current endeavors. If you are inspired, come to my gallery to see more in person or order from my online gallery and hopefully one of my pieces will become part of your personal collection. 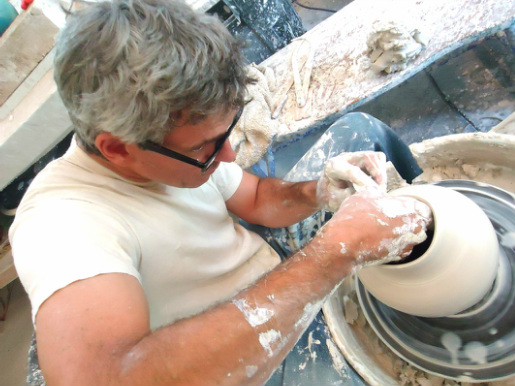 The Midcoast Potters Annual August Studio Tour has six participating artists this year who will open their galleries, studios and kilns to the public on August 6th and 7th, from 10 to 4 each day. I'm happy to be a part of this and look forward to seeing you! Follow GEORGE PEARLMAN POTTERY's board Spring Collection | 2015 on Pinterest. This year's paddle auction in Thomaston raised $16,280 to support the youth programs of Trekkers. I was fortunate once again to participate as one of the invited artists who created a piece to support the Trekkers. The auction was a great success and the raised funds will keep this wonderful organization providing travel and education opportunities for local youth. The donated piece is entitled "My own worst enemy." Trekkers is a non-profit, outdoor-based mentoring program with a focus on adventure-based education that operates out of Thomaston, Maine. In 2014 they came up with a fundraising idea where they invited artists from the area to decorate a wooden lobster buoy and then held an art auction to raise money for the organization. This piece is my answer to being presented with the wooden buoy, entitled "I'm Not Singing in the Rain." A chop mark is a ceramists’ signature. Most potters have a 'chop' (a wood or clay stamp) they impress into the bottom or side of their pottery before it’s completely dry. I have been using my chop mark since 1994. It is the result of my exploration of the idea that there is no such thing as unmitigated expression. Through challenging myself to exhaustive painting marathons, I have done everything I can to get out of my mind and into the place I assumed originality resides. My mark making did not feel original despite my research, but I did notice that the way I divided space or composed my drawings and paintings, had a clear theme that looked generally like what my chop mark is today. I did not know this research would end up in my chop. Instead, the way I divide space led me to focus on specific drawings and sculptures. A series of drawings of three people intertwined, a series of drawings of three tires, a series of sculptures of old televisions and dials were some of the ways I explored what felt like my specific way I divide space. While these were exciting explorations for me, especially my "television series," none of them felt like a clear expression of my original exploration of unmitigated expression. I let the piece become completely abstract and built a series of sculptures that were essentially a box with three disks on top of it. They seemed too large and I made them smaller. They still seemed too large and I made them smaller still and that is when it struck me that as a tiny sculpture it was perfect and that using it as my chop mark would be the perfect venue for it. When I carved my chop and stamped it on my pottery, I knew I found a truly complete answer to the aesthetic challenge of signing my pots. It was vastly better than the scrawl of my name and date that I was using up until that point. While it may seem like a small detail, how an artist signs their work is as much a part of their aesthetic as any other part of the piece and I feel quite complete in this aspect of my work. So, is there such a thing as unmitigated expression? Well, as hard won as my chop mark is and as original as it feels, I have to say that there is no unmitigated expression. There are many reasons why, but interestingly, I travelled to Philadelphia Pennsylvania about seven years after I started using my chop. I visited the beautiful Japanese house that was designed by architect Junzo Yoshimura and built originally in 1953. It is wonderfully situated in Fairmount Park and was designed as a traditional antique Japanese home. It was given as a gift from Japan to the USA as a sign of post war peace. It is beautiful with its koi pond, luscious garden, rice paper doors, tatami mats and a huge timber that runs the length of the peak of the roof. After thoroughly exploring the house and garden, I sat back from the house in the grass and wondered at its beauty through the blossoming trees and there, to my surprise, heroically carved into the end of the massive roof timber, I saw a square with three circles above it. I was stunned and then could not stop laughing and then I immediately contacted the director of the board of the non-profit organization that manages the house and asked him what this mark means, who carved it, when did they carve it and why did they carve it???????? The answer, unfortunately, was "I don't know." I still don't know the answer to those questions, but I do know that our ideas about originality go much deeper than simple plagiarism as somehow I managed to be copying something that I had never seen before and existed before I was born. Realizing this made me even happier with my chop as it says so much about how interconnected we are beyond what we can see. The idea that there is no such thing as unmitigated expression is not a sad comment on our lack of originality, instead it is a celebration of our amazing interconnectedness, our visual archetypes, and our common language of abstract forms.